Chloe McDonald is an original member of the club, starting out as one of the youngest players the club has ever had. She has grown to be a fantastic leader, including coaching and encouraging the development of many university girls who have joined the club. This is what Chloe has to say about her time at the club. I have been involved in this club from the first season in 2007 and have been playing and/or training with the club since that time. It was my first season playing ultimate. What was your path that lead you to Team Box? I was pulled along to a training day by my brother towards the end of 2006 and had a bit of fun. 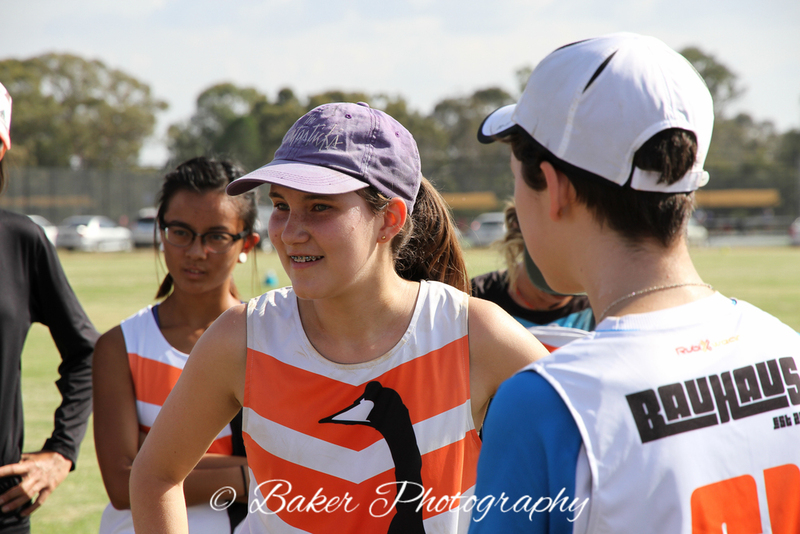 After that I threw a frisbee around at school, started playing in Creswick and then was pulled along to Team Box training by Greta, Amanda and Arwyn. I didn't know the rules properly or had any idea what I was in for. What is your favourite Team Box mascot and why? Where has playing with Team Box taken you? Since starting with Team Box I have played u19s twice in 2008 and 2010, u23s in 2013, World Clubs in 2014, then Dream Cup and AOUC in 2015. Throughout all these events I have travelled to a bunch of different countries including USA, Canada, Germany, Switzerland, Italy, Japan and Hong Kong. I wouldn't have achieved any of this without Team Box and the experiences I have had with them. I have stayed with the club because it is a supportive group of people who bring an amazing atmosphere. Even when I travelled from regional Victoria to training each week and often missed out on a lot of social stuff, I always felt included. Experienced players in the club are always keen to help newer players which is something I noticed from my very first training, and the leadership are always trying to help everyone improve and achieve their maximum potential. I love these guys, they are like family. What your favourite uniform combo? At Team Box training what do you look forward to the most? I look forward to seeing everyone and being able to work hard with a bunch of people who have the same goals and focus as I do. Shannon Trenwith came to us in style, wearing a bright red jumpsuit, which proved that she was the perfect fit for the club. This year she is also on the Australian Firetails team going to London, and we wish her all the best! My first season with the club was in 2011 in Brisbane (the jellyfish year), so I suppose this is going on 5 years as a part of the club. What is your favourite club moment? In my first season with the club, I turned up one day in a jumpsuit, that was subsequently passed around the whole team, and the season theme ended up being jumpsuits. I remember that being a super fun year - especially seeing people like Snail and Zab try and make that suit fit! Where has playing with the club taken you? I've played with STBAU all around Australia, but I'm yet to attend an international tournament with the team (though I have been watching on and cheering in my living room, suffering epic FOMO!). And (due to missing a season) I have still never won Nationals! What’s the biggest difference between when you started playing with the club and now? The people! There is so much growth and so many more opportunities at the club now. With that, the vibe has evolved, there are new personnel and the club has had to grow up a bit and (hopefully) not get too serious with all that. The focus on development has been great and there are some fantastic people dedicated to that now so that the club can balance the different needs of a wider range of players. This club feels like home to me. There are so many friends here and people I've played a lot with. I think the club has always pushed outside the status quo and pushed players to think differently and play smarter, and I am such a better player for it. It's been a club that can go from silly to serious and everywhere in between - and I love that vibe. I think that's why people play ultimate at the end of the day - it can be competitive but we are all here to have a good time. Dominate the women's ultimate circuit - nationally and internationally. I think the elite standard in Australia will keep lifting and I want to see the club developing players and leaders who are ready to not only cope with that but lead the way. I also want the club to be a place where people have options to play at all levels, and to actively promote ultimate in the community. I would love to see us teaching ultimate to all sorts of people. Tegan Don is a big part of our club, both on and off the field. She has previously been part of our coaching staff and also brings delicious pastries for post-training snacks! This year she is also representing the country at the WUGC on the Australian women’s masters team, the Flying Foxes, with a few of her club mates. When did you play with Team Box? On field - Winning nationals in 2010 in Adelaide. Had been in the Final the year before and it was amazing to go one better and win it! Off field - Specific I know, but a camping trip to Wilsons Prom with a bunch of girls where the "threat" of a wombat attacking our tent led Palmer to believe that I was a wombat.... Not so funny at 2am but definitely good laughs after. What’s the biggest difference between when you started playing with Team Box and now? The biggest difference between then and now would be sheer numbers! The amount of talented women who want to play and own their game is brilliant. What is your favourite piece of Team Box paraphernalia? Definitely the socks from World Clubs. I only wish I'd brought more pairs as they are starting to die! If you could play any tournament with Team Box/STBAU, one you did play again or one you didn't but wish you had, which would it be and why? If I could have played a tournament I'd missed it would have been Nationals 2007 - the inaugural year of Team Box (I was still playing with Sultry [Brisbane] as had only moved to Melbourne in February). I knew I wanted to be a part of Team Box after watching their style of play, their respect for everyone on the pitch, and of course the excellent uniforms. However, if could re-play a tournament and change the outcome of just one game it would have been at World Clubs in Italy against Japan's Uno - so close! Martha Gregory is a great friend to the club! She may have only played one Nationals season with us but she gets the call when we play international tournaments because her infectiously friendly attitude and hard playing are always an asset to our team. Currently living in New York and playing for BENT, we wish her all the best and we are sure we will see her soon! Here are some of her thoughts about our club. When did you play with the club? I played with Steam Baudron [Squadron] for the 2011 season but also at Kaimana in 2014 and Dream Cup in 2015. What is your favourite STBAU moment? My favorite club moment might have been WINNING KAIMANA with you guys. Or the Kimono-Mandatory team meetings at Dream Cup... or our Jumpsuit-Mandatory practice before Nats in 2011... so many! What is your favourite Club mascot? I would tell someone new to join because they wouldn't only be joining an incredibly talented group of athletes, but they'd get to help continue building something positive and rewarding. Bauhaus is a group of wildly silly women and absurdly brilliant frisbee players whose love for each other permeates everything they do on and off the field and whose positive team culture reverberates throughout the Australian frisbee community. I am immeasurably proud to be a Bauhaus alum. What is your most memorable tournament with the club and why? Winning tourney MVP at regionals in Hobart while playing for Squadron was a big moment for me as a player and quite possibly the start of my more mature frisbee goals...Most memorable tournament though is so hard! Kaimana I guess has to be the most memorable but Dream Cup was pretty incredible too.. and Nationals in 2011 was my first really intense elite level tournament which was also really big for me. I'd love to see Bauhaus come to New York! Or do a US tour! Ashleigh Thornton joined the club in a good year, when we won our first gold at Australian Nationals, and since then she has continued to be a strong member of the club. She also works hard behind the scenes of ultimate as a previous club committee member, is on the AFDA Board and the current Australian women’s team manager. We asked Thor a couple of questions. What is your favourite Team Box/STBAU moment? This one is really hard. I have missed playing a few seasons, but despite this I know off field I loved watching the team win Nationals in 2014. On field, I just loved all of the 2015 season. I think that is my fondest memory, it is just too hard to pin point any one thing!!! Where has playing with Team Box/STBAU taken you? Sadly I have only ever played Australia tournaments with Team Box. I did travel to Kaimana Klassik [Hawaii] in 2013 with a hybrid team, where some Squadron girls played with some Canadian girls, however I have only played with a true Team Box team within Australia. What is your favourite piece of Team Box/STBAU paraphernalia? If you could play any previous tournament, one you did play again or one you didn't play, which would it be and why? Nationals 2015. It was my favourite tournament with the club. We had two elite teams representing the club, and with so many players staying together and playing on the beautiful fields in Perth, it was amazing! Except for the last game when I tore the ligament in my hamstring, I don't want to do that again! The increased number of players, and types of players that have come through the club have changed it and only made it more awesome. Everyone brings their own type of fun! Karen 'KP' Baker has been there from the start, however she was playing against Team Box in their first year as a team. Since then she has been a staple at the club, a fantastic player on the field, she takes amazing photos with Baker Photography, and leads the club's mental strength sessions. This year she is also the Assistant Coach of the Australian women's team, the Firetails, who are competing at WUGC in London. We asked KP a couple of questions about her time at the club. How long have you been a part of Team Box/Bauhaus? What was your path that lead you to Team Box? What is the most valuable thing you have learnt from Team Box? The biggest difference is that I have two kids. At tournaments what do you look forward to the most with the team? The best thing about my time with the team is feeling 100% supported, with no niggling concerns that any other player didn't absolutely trust and support me. At tournaments, I look forward to playing hard and seeing everyone's effort come together into one marvellous team whole. If you could play any past tournament, one you did play again or one you didn't play, which would it be and why? WUCC 2014 in Italy. Despite disappointing results, it is the most cohesiveness I have ever felt as a player on a team.